Each new season you'll find me fiddling with silk flowers and putting together wreaths, and this weekend I've been working on one for the front porch. But finding one that will fit is always a problem. Most of the time I just give up and go with a bunch of silk branches or flowers for the large wicker cone that's on the side of the front porch. But last year we had an upset with some little finches that wanted to make a nest in the cone with my faux flowers. I thought I had managed to escape having to leave out green poinsettias until May...but no. They were all over that wonderful spot. So when I was able to hijack their plans, or so I thought, a nest of little eggs were dashed on the front porch concrete by accident. Well, birdie lover that I am, I felt horrible and realized that I would have to do better this next nesting season. That meant NO WICKER CONE!!!! Lovely nesting spot in the white cone to the left. but you can see what I mean. ...the perfect, out of the way, nesting spot. You can also see my dilemma with my finding a wreath for the door. It's one of those glass storm doors, that only give you a few inches to work with. So if I put a wreath on the door, it has to be super skinny! hanging on a recent purchase from Pier 1. Isn't this blackboard just so cute and scrolly? I have plans for it on the sideboard in the hall after Easter. like a twig or two of forsythia and a nest. Just grabbed a few extra goodies from the flower bin and wired them on. I think this may have saved the day. Debra the skinny wreaths look great and I love love love the chalkboard! I need to do skinny wreaths or other things on our front door, too, Debra. I just redid one for Spring myself. Love that blackboard! I'm still thinking of putting out a basket for Spring on my wall grate. If the wrens build there, they won't be disturbed until the little ones have flown the nest. Now, dear friend, that chalkboard is exquisite!!! It will be breathtaking on the sideboard!!! So~o~o glad (Naughty)Nita made you purchase this piece for Common Ground!!! Have a great week ahead...for me it's the continuation of Spring Cleaning!!! Love your skinny wreath and that chalk board really cute. I had the same thing happen with Robins nesting in my wreath last year. I guess the wildlife likes to be part of the decor too!!!! I love the wreath! Not sure what a storm door is all about...I guess that's a sign that I am from California. That Chalkboard is wonderful! Absolutely one of the prettiest I have ever seen! It looks so pretty! Forsythia is a favorite of mine, and I love bird nests too. I had a wreath on my front door that the birds loved to nest in, and have to keep a close watch on anything on that door. 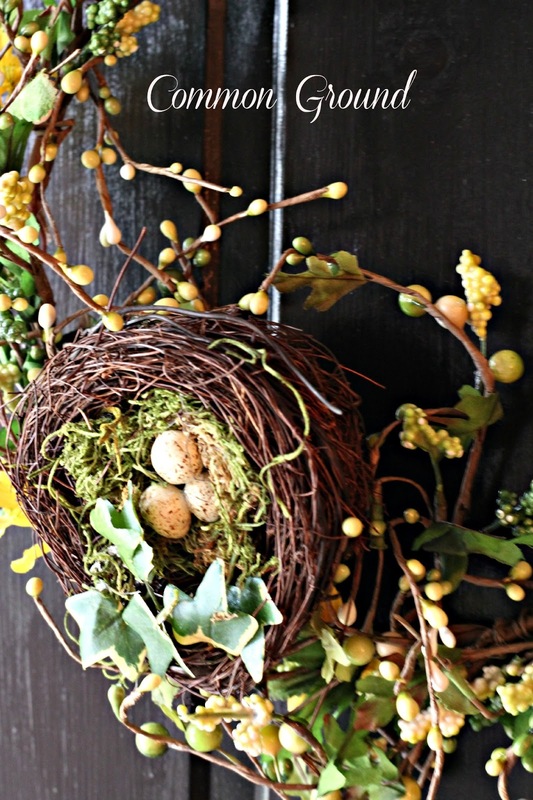 You have inspired me to get my Spring wreath made today ( I got some faux dogwood the other day and a cute little nest). I think yours will look great on your dor and I look forward to seeing that awesome chalkboard hung up. The nest is a nice touch on the wreath, Debra. Of course I love the chalkboard. Here is a suggestion for your storm door: use one of those magnet things (you can find them @ HL). One side with the hook goes on the front, the other on the back is attracted naturally to it. I use this on our storm door in Wisconsin. Then, you can use as fat a wreath as you want! 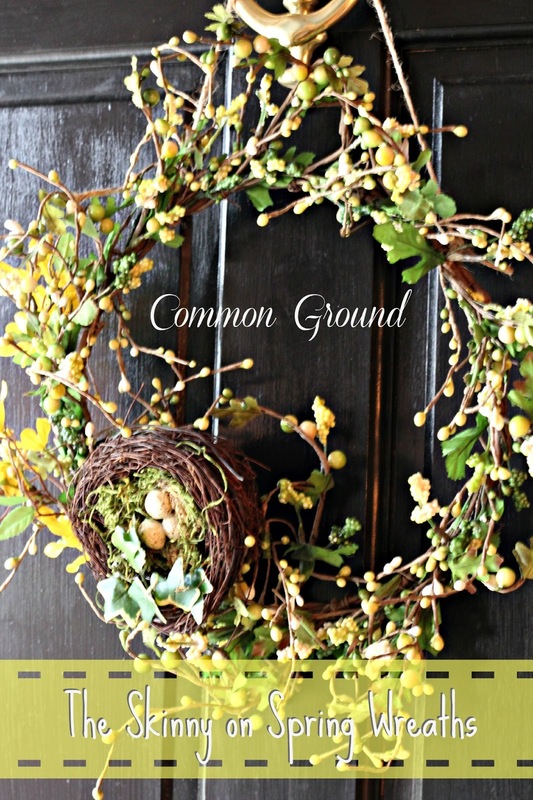 I love the chalkboard and your new Spring wreath. Check your email and spam for an email from baubles. I am sorry we are having such a hard time getting in touch. Love the chalkboard and the skinny wreath looks like it will work! I have the same problem. Can't find one skinny enough due to the storm door. Your wreath is just lovely! And holy moly, that blackboard is gorgeous!!!!!!!!! Love, love, love it! Love your skinny wreath! We have birds nest in our front door baskets too. Great idea. Love the bird story. At Christmas time we put up a 6-foot artificial tree on our front porch decorated with red flowers , pine cones and colored lights. The sparrows loved it so much they spent the entire month perched upon the limbs. Our theory was, the lights kept it warmer at night. We love our birdies too! I love the wreath! It's perfect for spring! such a clever way to make a wreath, debra:) and the chalkboard is just fabulous! have a great week! Love it! 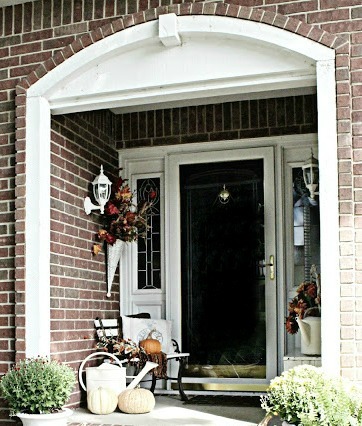 I have that same glass storm door and like you have to find a skinny wreath! I have one that I bought at Target several years ago on after Easter clearance:) It works perfectly! Have a blessed day dear Debra! HUGS! We have the same storm door so I know exactly the challenge you speak of for a skinny wreath. I have a window on my door so I usually do a swag below it. This year I squished it at Christmas and the door is empty. But we are expecting 8 inches of snow today so I'm not really feeling all that springy yet! Love the chalkboard! I have birds that nest above my door in the grapevine wreath. My husband HATES having to clean that up each year! I used to have one of those storm doors.....I always hung my wreaths right on the door...why can't you do that? Yep I think you saved the day! That is lovely! I am a passionate wreath lover.....always finding new bases and flowers to make another one. Yours is perfect and simple and perfect for spring. Love it! Oh...gosh! Look how great that chalkboard looks in your house! I knew it would. It is really a nice size. I love it when we get white things in. We don't get a lot and they don't sell that well...but of course that is the stuff I want. 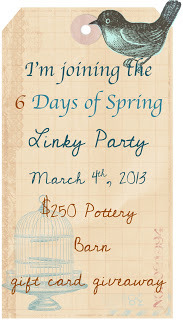 I am so sorry that you are having trouble linking up to my party. I really don't know why this has happened because I do see where you have a link back to my blog on your post. The skinny wreath looks awesome. I have the same problem with birds wanting to nest in anything I put on the outside of the door. I tried putting forks in the planter last year and they still managed to make a nest in there. I'll try the skinny, behind the storm door, wreath this year. Your wreath is perfect and that blackboard is to die for! Congrats on your feature at Dedicated House - pretty wreath and I have the same problem. I usually have a flat wooden figure for the season so I'll be on the lookout for a super skinny.